"Aan het plantsoen" is a nice family home with a spacious backyard and a large park in front of the house. The modern house is located in Amsterdam, 7 km from the vibrant centre; there's free parking in front of the door, Schiphol is 8 km away and can very easily be reached by bus (15 minutes). There are 2 bicycles and 2 children's bikes (for 5 and 8 years olds) available. On the ground floor you'll find the pleasant living room with comfortable seating area and dining area. You can use the sliding doors (which can be opened completely) to walk straight into the garden. The dining area borders on the spacious, practical and fully equipped kitchen. In the hallway on the same floor you'll find a toilet, coat hanger and a large cabinet for shoes and supplies. The first spacious bedroom can be found on the first floor. It has a single bed and a trundle bed, as well as a children's desk with chairs. The bathroom with shower cubicle, bathtub with shower, washbasin and toilet is also located on the first floor. Using the stairs you'll reach the second, very spacious bedroom with a double bed and a sunny balcony. A separate room with wardrobes, a washing machine and dryer borders on the master bedroom. On this floor there also is a single bed, which can be placed either in the spacious bedroom or in the bordering dressing room. The centre of Amsterdam can be reached by bike or public transport; the bus stop is a few hundred metres from the house. You can be quickly in the Vondelpark, the van Gogh museum, the Rijksmuseum, the nice restaurants in the Jordaan and the Seven Streets. At less than 2 km you'll find de Oeverlanden, an area with several beaches on the Nieuwe Meer. The bike or walking ferry to the Amsterdamse Bos also leaves from here. The picturesque centre of Haarlem is 20 km away and the beaches and the sea at Zandvoort are 25 km away. Yays Bickersgracht Concierged Boutique Apartments. Located in Centrum. Sublet.com Listing ID 3667374. For more information and pictures visit https:// ... /rent.asp and enter listing ID 3667374. Contact Sublet.com at ... if you have questions. Located in Oud-West. Sublet.com Listing ID 3623298. For more information and pictures visit https:// ... /rent.asp and enter listing ID 3623298. Contact Sublet.com at ... if you have questions. Very comfortable, spacious studio in a top location, in a 16th century canal house, on one of Amsterdam's most beautiful canals, close to Leidseplein. All sights in Amsterdam, such as the Van Gogh Museum, the Rijksmuseum, the Banksy Museum, the Heineken Experience, the 9th Street, the Jordaan, the Dam, the Flower Market, the Main Street, The Vondelpark are located a short walk from the studio . Around the Leidseplein, which is around the corner, you will find all trams and buses to all corners of Amsterdam. One dog on request allowed The nice studio has its own entrance. The spacious studio has a large 2-person box-spring bed (200 x 160) and a cozy seating area. The studio has a large luxury bathroom with separate shower, separate bath, double wash and private toilet. There is good and fast Wifi and there is a coffee maker and kettle available. On arrival there is a snack, a drink and some fruit for you. On request, it is possible to order a local breakfast in the Studio each morning. Bath and bath towels are provided as well as hair dryers, shower and shampoo. The studio owner is looking forward to receiving you with open arms and making your Amsterdam experience in the studio and the service a complete and memorable picture. 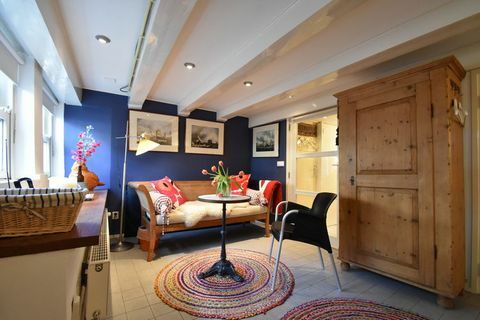 The studio is in the spacious basement of a beautiful 16th century Canal house. The canal house is one of Amsterdam's most beautiful canals. The studio has its own entrance and exit and has a small terrace on the canal, where you can sit by the end of a day and enjoy the many passing boats. "Feel like a local of Amsterdam." Extra person on request on extra mattress (on the ground). Please inform us about your estimated time of arrival 24 hours in advance. Located in Centrum. Sublet.com Listing ID 2872505. For more information and pictures visit https:// ... /rent.asp and enter listing ID 2872505. Contact Sublet.com at ... if you have questions. Beautiful ground floor house at the museum area "Oud Zuid". Beautiful fully furnished ground floor house is available for you and your family or friends :) The house is located in the beautiful and famous "Old South" neighborhood. Studio apartment (45m2) with garden in the courtyard, quiet, WiFi, central location. In one of the most popular areas of Amsterdam, 900 meters from the Museum Quarter (the Empire Museum, the Van Gogh Museum and Stedelijk Museum) and just 1500 meters from the famous Amsterdam's canal district (UNESCO World Heritage Site). Apartment in the center of Amsterdam with Internet (442805). Spacious two bedroom apartment with a fantastic roof terrace, for up to four people, in Amsterdam No. Spacious two bedroom apartment with a fantastic roof terrace, for up to four people, in Amsterdam North. Canal View Apartment, Heart of Amsterdam. Welcome to our beloved apartment! Our recently renovated, spacious place is located on the ground floor of a beautiful monumental building at the Herengracht (Gentleman's canal) in Amsterdam. Welcome to our recently renovated apartment at the Herengracht. Our 100m2 apartment is the perfect place for families, colleagues or groups of friend to experience the 'real Amsterdam'. The space This apartment is located on the lower floor of a majestic town-house on high end Willemsparkweg. After entering the house sharing the hallway with the owners of the building you will enter your private floor bellow. Urban Lodge Hotel - In Amsterdam. Apartment picturesque Canal View and drawbridge - without breakfast. An apartment located along a 17th century canal on the 1st floor of a 19th century building, with a bedroom. The living room with three large windows and balconies offer stunning and picturesque views of the canal and the monumental drawbridge.